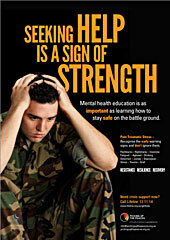 PTSD Education is critical in breaking down the stigma and helping people identify the early warning signs! There is an enormous need for education in regards to Post-traumatic Stress Disorder and associated illnesses, and Picking up The Peaces has designed an effective training and delivery package. The PTSD Education and Literacy program is currently being delivered to emergency service personnel. The sessions aim to educate members from high-risk organisations, such as our Police, Fire and Rescue, Ambulance, Rural Fire Service and the State Emergency Service, or any organisation that is at risk of its employees being exposed to potentially traumatic experiences. What PTSD is and how it manifests. How to ask for help and what support is available, and how to help your work mates. What resources members can access and how to identify clear pathways to evidence-based treatments. We focus largely on detecting early symptoms, either in yourself or work mates, and why seeking treatment early is critical for a full recovery. Our program highlights the damage of stigma. We have now implemented a highly effective interactive method of demonstrating how stigma and negative language impacts on those who may need to seek assistance. The program combines factual material about post-traumatic stress disorder with personal stories from those living with PTSD. Current research demonstrates that utilising those with the lived experience is an effective way of breaking down the stigma and encouraging help seeking behaviour. The program is delivered peer to peer by those who have experienced first hand working in an emergency service environment, and who also understand the culture and social identity of being an emergency service worker. 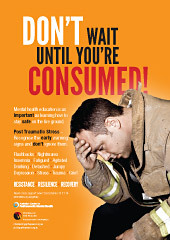 The program is currently being delivered through all ACT Fire and Rescue employees, with brilliant feedback. The results are improving in each session delivered and are fetching even higher results than those from our original pilot program. PUTP is having our program externally evaluated and the interim report has now been completed. Below are some of the results and comments from the interim report. 89% of those who gave ratings rated the presentation 7 and over. 36% of the ratings were 9 and over. The most frequent rating given was 8/10 – we scored many 10/10 and only one low score of a 4/10. These results are great! 86% of those with some previous stigma noted a change to a more positive view about PTSD after the presentation. In all sessions, comments were very positive, with almost no comments as to what was not useful and very few suggestions for improvement. The most frequent word used to describe the presentation was ‘informative’ (35), followed by ‘helpful’ (11) ‘good’ (9), ‘excellent’ (5), ‘relevant’ (4), ‘honest’ (4) and ’passionate’ (4). The most useful parts of the presentation were: ‘all of it’ (22), the personal experience/story of the presenters (18), and signs and symptoms of PTSD (12). “I’ve been in the Service for 28 years, this is what we have needed – exactly”. “Would be worthwhile integrating this info into volunteer induction training for various agencies”. Research now demonstrates beyond reasonable doubt that organisations at risk of trauma related injury must provide education to their employees. Although stigma is a societal issue the workplace must address ‘stigma’ and the negative effects it places on those employees who are potentially at risk. Changing the culture of an organisation surrounding mental health and well-being must be instigated from the highest of leaders within an organisation and filtered down through the various ranks into front line emergency service personnel. A change of culture surrounding mental health and how PTSD is viewed (normalising PTSD as a Psychological injury) will directly assist in breaking down the stigma, allowing those to feel more comfortable to seek treatment before PTSD becomes entrenched and more difficult to treat. Clear pathways to evidence-based treatments must be easily identifiable and accessible. Education to families of those at risk must be provided as it is they who usually notice the very first signs of distress. Are you a friend, carer or partner of an emergency service worker and happy to chat about your experiences of being with someone who has PTSD? 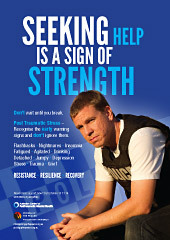 Have you been diagnosed with PTSD and understand the difficulties people can face? Would you feel comfortable talking about your experience with PTSD? Can you relate well to people? Do you come from an emergency service type role? If you can, you can help save lives. All volunteers will be fully trained and provided with support by Picking Up the Peaces prior to and during the period of delivering the sessions. The volunteer presenters will work in pairs and be reimbursed for costs incurred. To learn more or to register your interest in becoming a volunteer presenter, please email.